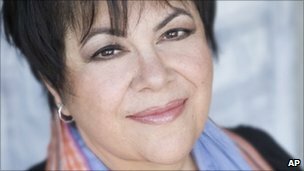 US folk and blues singer Phoebe Snow has died, 26 April 2011, of complications from a stroke she suffered last year, aged 58. The singer-songwriter, who was best known for her 1975 hit Poetry Man, had been in a coma since the stroke in January 2010, her manager said. Snow largely dropped out of the public spotlight soon after her first album to care for her daughter who was born with a severe brain injury. However she continued to make albums, releasing 16 during her career. Born Phoebe Ann Laub in New York City in 1950, the singer changed her name after seeing Phoebe Snow, a fictional advertising character for a railroad, on trains that passed through her hometown in New Jersey. Her acclaimed 1974 self-titled album debut reached number four in the chart, spawning the hit Poetry Man as well as earning Snow a best new artist Grammy nomination. A year later, when Valerie was born with hydrocephalus, a buildup of fluid in the brain cavity, Snow decided to care for her at home rather than place her in a hospital. Although she was not expected to live more than a few years, Valerie later died in 2007 aged 31. "Occasionally I put an album out, but I didn't like to tour, and they didn't get a lot of label support," the singer told the San Francisco Chronicle in 2008. "But you know what? It didn't really matter because I got to stay home more with Valerie, and that time was precious." Ray Columbus has paid homage to the songwriter of the iconic Number 1 Australasian smash hit for Ray Columbus & The Invaders 1964 hit, 'She's A Mod'. Terry Beale died peacefully in the UK at home in Redditch, Midlands. Born on September 20, 1944, Beale was the lead singer and songwriter in a Birmingham band called The Senators. 'She's A Mod' was never a hit for The Senators but they were a part of the new wave of British invasion bands that arose in the early 1960s. Their line-up included the future Led Zeppelin drummer John Bonham. A Mod' to Ray Columbus & The Invaders and the band made the song a national sensation. The song was a perfect fit for Columbus, who had made the 'Mod's Nod' dance infamous in Australia as they sought to counter the 'Surf's Stomp'. The song quickly rose to Number 1 in New Zealand and Australia and reached the top 100 charts in the United States. Ray Columbus & The Invaders were the first New Zealand band to achieve this. Does this ring a familiar bell? said Rick Morin in an email asking for help for a Coast listener about a song she been hunting for ages now, "the problem is I dont know its name. The only part of the song I know is "Pictures in the Hallway" its a female singer and its about her husband that died in the war and all she has left is the pictures in the hallway. It would be a really big help if you know its name or where I can find its name. My grnadmother used to play it for me and it would mean a heap if I can find it." I hadn't heard back from Rick if this answered his listener's query but Scott said "It could well be, the only thing that didn't fit was song relating to WW2. I remember this as theme to movie Thomas Crown Affair. He might not have been what you would call a singer, but interesting lyrics regardless. He also did a song called A Young Girl, rather a morbid tale about a girl ending up dead in a ditch." As a 20-year-old, Johnny Preston, who died 4 March 2011, aged 71, had a massive hit on both sides of the Atlantic with the song Running Bear. 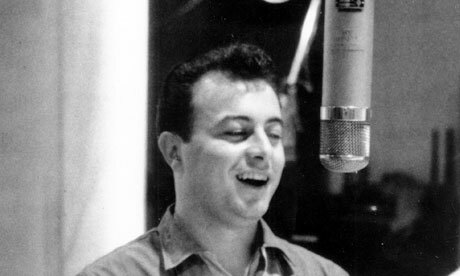 With its infectious, rhythmic "ooka-chunka" chant, it told of the doomed love affair of two Native Americans, and was composed by disc jockey and songwriter JP Richardson, also known as the Big Bopper. He said he was inspired to compose the song by a Dove-soap television commercial, but it was equally indebted to Shakespeare for its Romeo and Juliet theme, with the eponymous hero's love interest, Little White Dove, belonging to an enemy tribe. The song also neatly fitted the "death disc" trend of the era, whereby songs such as Endless Sleep [see footnote] and Tell Laura I Love Her depicted the premature demise of teenage sweethearts. Preston had been playing in local clubs when Richardson discovered him and introduced him to Mercury Records. Running Bear was due to be released in spring 1959, but in February of that year, Richardson died in the plane crash that also killed Buddy Holly and Ritchie Valens, and Mercury thought it politic to delay the release of this "death disc". When it did come out, in September, it was playlisted on numerous radio stations and slowly rose to the top of the US charts, hitting the No 1 spot in January 1960. The record was memorable for Link Davis's honking saxophone accompaniment and its backing vocal sound, apparently taken from B-movie producers' idea of the war chants of Native Americans. The backing singers were the Big Bopper, record producer Bill Hall and the future country-music star George Jones. The war-chant sound was to inspire Jonathan King's 1971 cover of Hooked on a Feeling, and the song was equally successful in Britain, where it reached No 1 in March 1960, deposing Poor Me by Adam Faith. Ferlin Husky, whose 1957 hit Gone helped create what became known as the Nashville Sound, died 17 March 2011, age 85. Gone and Wings of a Dove each topped the country charts for 10 weeks, and both were Top 20 pop records. The Tennessean writes that Husky, who also starred in movies and entertained with his comedic alter ego, Simon Crim, was "a master of stagecraft, a dashing and energetic performer who impressed audiences and fellow artists." Ferlin Husky, 85, a pioneering country-music entertainer in the 1950s and early '60s known for hits such as "Wings of a Dove" and "Gone," died Thursday at his Nashville home. 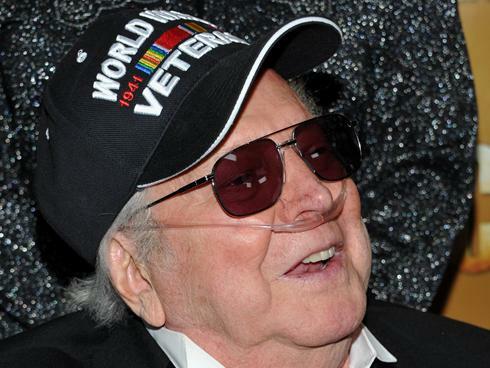 Mr. Husky, a 2010 Country Music Hall of Fame inductee, had a history of heart problems and related ailments. With his resonant voice and good looks, Mr. Husky was one of the most versatile entertainers to emerge from country music. He was a singer, songwriter, guitarist, actor, and even a comedian. 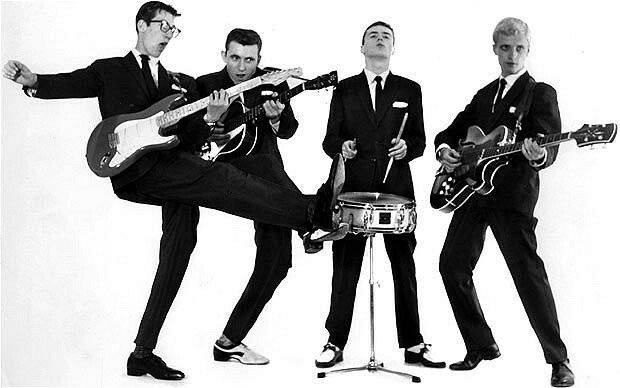 Jet Harris, who died 18 March 2011, aged 71, was the original bass guitarist with The Shadows, the backing group that propelled Cliff Richard to fame, but left the band in 1962 and found success as a soloist and as a duettist with the drummer Tony Meehan. With his blond quiff, chiselled features and heavy-lidded eyes, Harris was considered the best-looking member of The Shadows’ line-up. But he left the group in 1962, having discovered that his first wife, Carol, had had a brief affair with Cliff Richard as the singer’s career was taking off. When the story got into the Sunday papers, Harris started drinking heavily. Harris had met Hank Marvin and Bruce Welch when they were jamming in the 2 i’s coffee bar in Soho in the mid-1950s. They were all amateur musicians who formed impromptu groups playing country and western music as well as the prevailing fashion — skiffle. Harris joined them in a band called The Vipers, led by Wally Whyton and then the best skiffle group in London. Meehan was brought in as drummer. In 1958, calling themselves The Drifters, Marvin, Welch and Meehan backed Cliff Richard on a tour of the Midlands. The singer had just released his first single, Move It, and was being promoted as Britain’s answer to Elvis Presley. In October, when the record producer Norrie Paramor booked them to make Cliff’s follow-up single, they added Harris to The Drifters’ line-up. They cut their first record with Cliff in January 1959 — Livin’ Lovin’ Doll — and a month later released their first single as a group, a vocal number, Feelin’ Fine. In May they recorded their first instrumental, Chinchilla, for the soundtrack of Cliff Richard’s first film, Serious Charge. In July a second instrumental, Jet Black, written by Harris, failed to make the charts. Later that month, while drinking with Marvin in the Six Bells pub at Ruislip, Harris suggested that the group changed its name to The Shadows to avoid confusion with the American group called The Drifters. They backed Cliff on his first No 1 hit Livin’ Doll, and in July 1960 had their first hit as a group with Apache, an instrumental that also topped the British charts. I was surprised, with the news of his death, that Jet Harris' wife had an affair with Cliff Richard. I didn't realise Cliff had hetrosexual tendencies - and obviously I hadn't read too much on Jet Harris and his early career. Or did those marital stresses get glossed over in his early bios? I imagine that affair affected Jet's chances of being included in the Cliff and the Shadows anniversary/reunion gigs. I had read somewhere that Jet was peeved that he wasn't included in any of the anniversary celebratory gatherings.